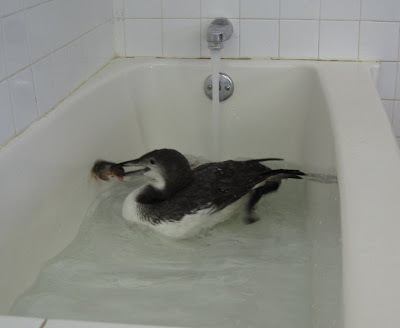 Taking Flight: Duck Lake Loon Prepares to Migrate to the Gulf of Mexico! Duck Lake Loon Prepares to Migrate to the Gulf of Mexico! The Duck Lake loon is nearing the time when he "migrates" to the Gulf of Mexico. Tomorrow seems to be the designated time as we wait for weather on both ends of the trip to clear. We have been working all week to get him into top shape. He is there now. When admitted he weighed only 8 lbs 3 oz. Now he weighs nearly 10 lbs. He has been gobbling food faster than we can get it to him. That is a very good thing. We actually bought out the retail bait dealers of minnows in our area. Just as we were about to make a drive to Stevens Point, ( over an hour drive) Hilger Baits of Antigo offered to supply "Duckie" with large 90 gram plus sucker minnows for the remainder of his stay with us. That is a huge weight off our shoulders. We are so grateful. For those of you that are unable to download the video above there are some photos taken tonight of the loon eating. 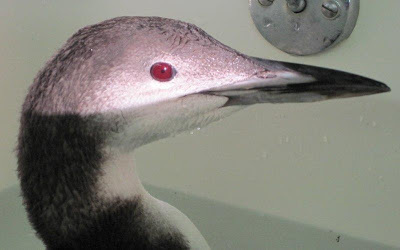 Under normal conditions a Common Loon would not need this kind of intense feeding. 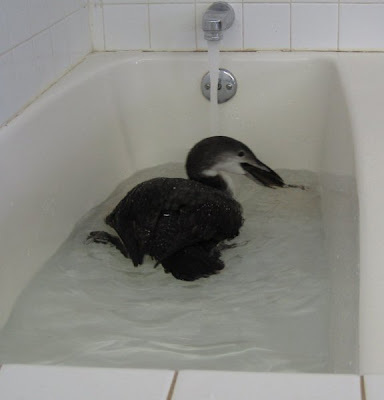 However, "Duckie" was underweight and anemic when he arrived. His his body is in "catch-up " mode. That will be it for tonight. Tomorrow we will have more as he continues to prepare for his migration via freeway to the Gulf.